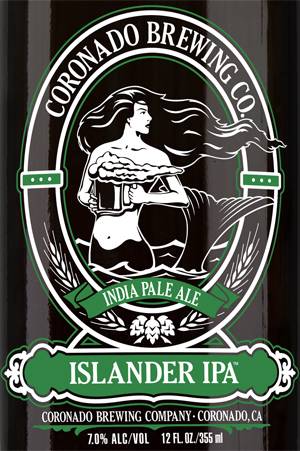 Winner of a 2014 World Beer Cup gold award in the American-Style Strong Pale Ale, Islander IPA is brewed with Nugget, Cascade, Centennial, Chinook and Columbus hops. Pours the color of gold pirate’s bullion. Tropical fruit esters of pineapple and mango combine skillfully with notes of grapefruit and pine for a full-spectrum IPA experience in the nose. This carries onto the palate at first sip, as a light caramel backbone provides structure for the array of hop notes that travel across the tongue. An enthusiastic effervescence carries the flavors and aromas and keeps the beer lively through the entire glass. The lingering finish of citrus and pine with just a touch of tropical fruit keeps the fun going. Antique gold glints through as it pours, and great gusts of yeast rise from the bottom of the bottle. The aroma is tropical—oranges, mango, pineapple, a whiff of musty papaya. The hops drop in sharp and hard, leaving the full body in place while banishing all malt flavor. The finish is dry and minerally, a lick of a stone slab. A fine strong IPA of a particular sort, and I’d enjoy it with Cuban food …some ropa vieja, rice and beans, and fried plantains.